This is a very interesting course that takes a very different view of making money from the Kindle platform. It’s especially intriguing because of their insistance that most people who try to make money from Kindle are doing it all wrong! 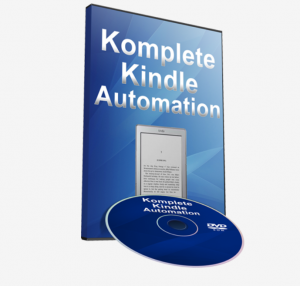 Now this is where Komplete Kindle Automation gets interesting. They got my full attention when I realised this was about how to outsource the whole Kindle making-money thing on a tight budget. This is EXACTLY the sort of thing I look for when I’m adding new income streams. If it’s hands-off I’m usually willing to give it a go! The basic premise here is one of chucking mud at a wall – some of it will stick and some won’t. But the bit that does makes the money, and that’s what counts. I think this is worth a look if you’re into outsourcing, and let’s face it, if you want to add new income streams to your set-up you really MUST outsource. Here’s a way to do it simply, cheaply and effectively, using Kindle to make money for you. Don’t like Kindle or writing? It doesn’t matter with this system!